This kit combines mixology, chemistry, and art to help you craft creative cocktails. 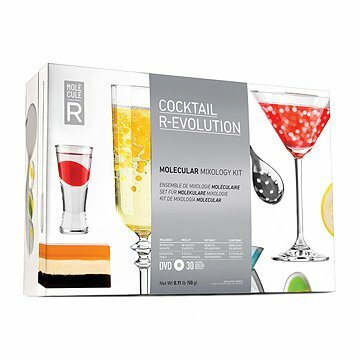 The art of the cocktail meets mad-scientist and creative chemistry in this molecular mixology kit. Deconstruct your favorite drinks, change their look, feel, and presentation, impress your guests, and take your tastebuds on an extraordinary adventure. Serve your mojitos with a flavor bubble that bursts in your mouth, bite into a layered martini, or add a touch of airy lime foam to your tequila shots! This comprehensive, DIY kit includes four pre-measured food additives, four specialized cocktail tools, and a 30-recipe DVD to facilitate your futuristic concoctions. Made in China. Check out the Food Styling Precision Tool Kit to pair with your Mixology Cocktail Kit. It's a conversation starter and a great party add, people love it and it entertains even the most 'posh" of guests. I can't wait for her to use it. It is a present, so she has not received it yet! Perfect gift for the home bartender. Get creative, cutting edge, mix science and make beautiful interesting drinks. Always looking for unique gifts for those who need nothing. My friend was delighted to spice up her drink making abilities. She wrote that she was heading to get an apron so she could be a true mixologist at the next party! I use this for when I want to put an interesting twist to some coming drinks. The box itself has everything you need (minus the alcohol). I loved the product. The only downside was that we had a difficult time getting the recipes for some of the drinks. Only because I the pamflet they give you with recipes and the recipes online ask for different measurements. It was just the right, unique gift!! This was just the unique gift I was looking for since my brother likes to mixed up different drinks and test them for his wife!! Have fun! As a mixologist, my son-in-law was totally surprised with this gift. He could hardly wait to try the various recipes (included). This was super fun for our recent get together.